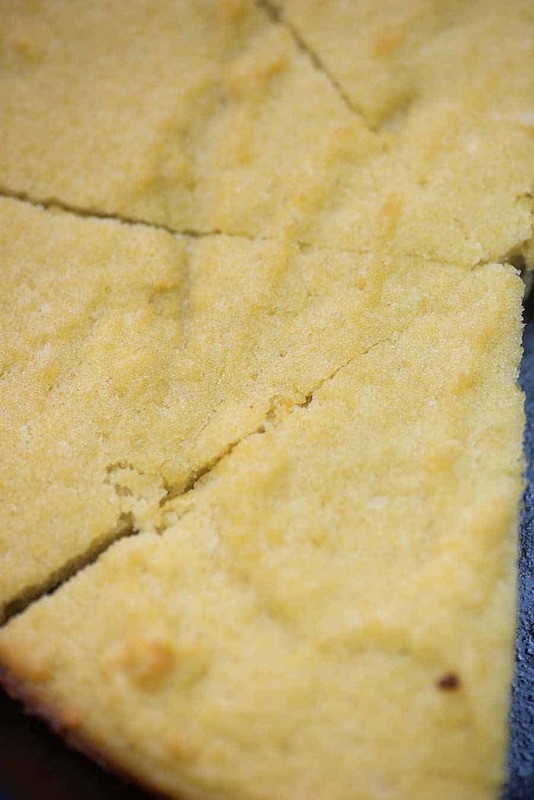 Low carb cornbread made with ZERO corn that actually tastes like the real deal! I’m so excited about this recipe and I think you’re going to love the authentic taste and texture with just 1 net carb per slice! So, that’s 4-5 new recipes a week. 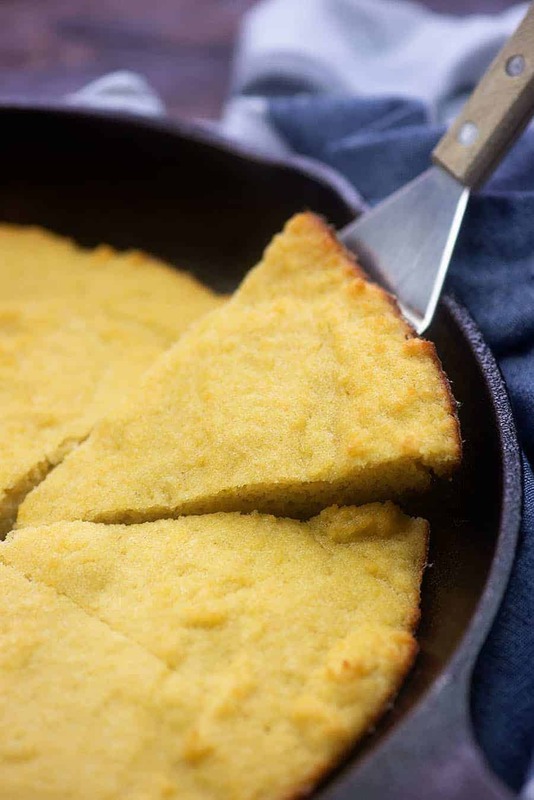 Obviously I love all the recipes that I share on the internet (plenty of recipes don’t make the cut), but THIS recipe for low carb cornbread is one that I’m extra excited about! I’m a huge fan of cornbread, but we all know that corn is full of sugar and starch and it’s definitely not a good fit for a low carb diet. 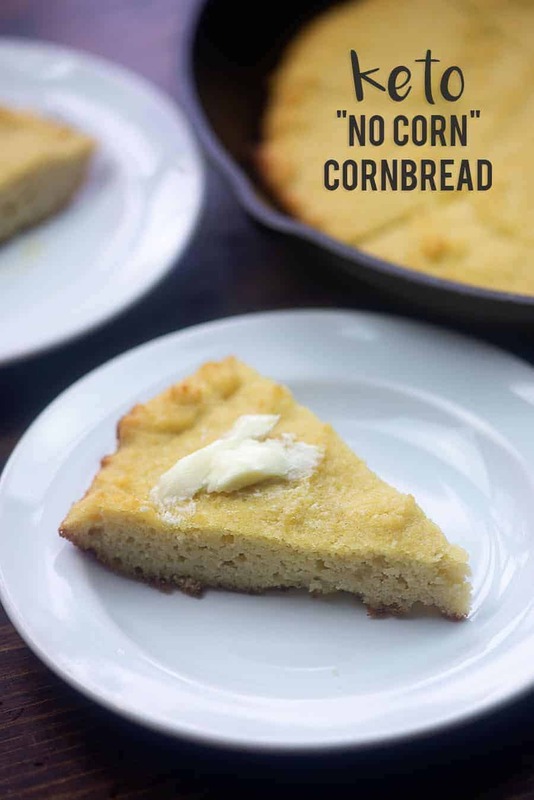 This low carb cornbread contains zero corn but it still somehow manages to taste soooooo dang close to ‘real’ cornbread and the texture is spot on too! I’m obsessed. I fed this to my kids and didn’t tell them what it was. Both assumed they were eating traditional cornbread! Smear on some butter or use this in some homemade stuffing <— recipe for that coming this week, just in time for Thanksgiving! Get excited. I’m super excited about this recipe because it doesn’t call for any ‘weird’ ingredients that you have to order online. You should be able to find everything you need at your local grocery store, which is a total win! You may even have all the ingredients in your pantry right now! You’ll need: coconut flour, your favorite sweetener (see below for mine), butter, eggs, cream, salt, and baking soda. Totally doable list of ingredients, right? You’ll just mix everything together in a mixing bowl and then spread into a cast iron skillet or 8×8 baking dish. 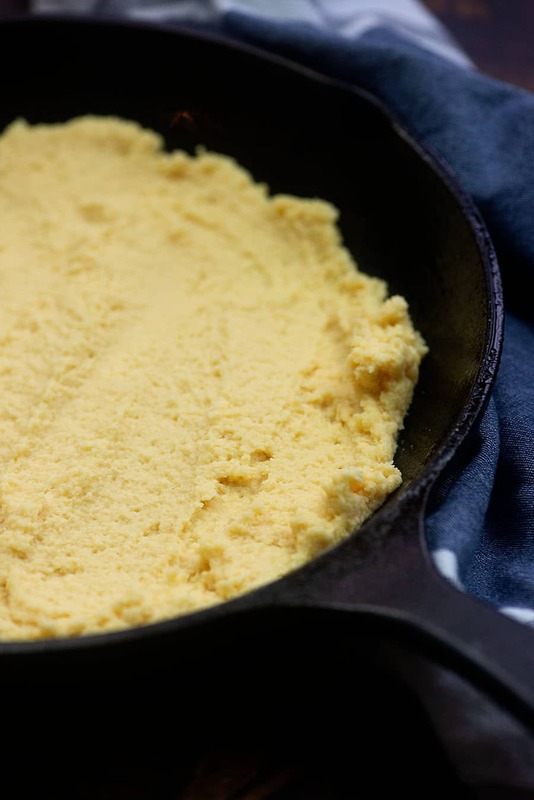 I prefer cast iron because it gives a nice little crunch to the bottom of the cornbread. Bake that up and then dig in. 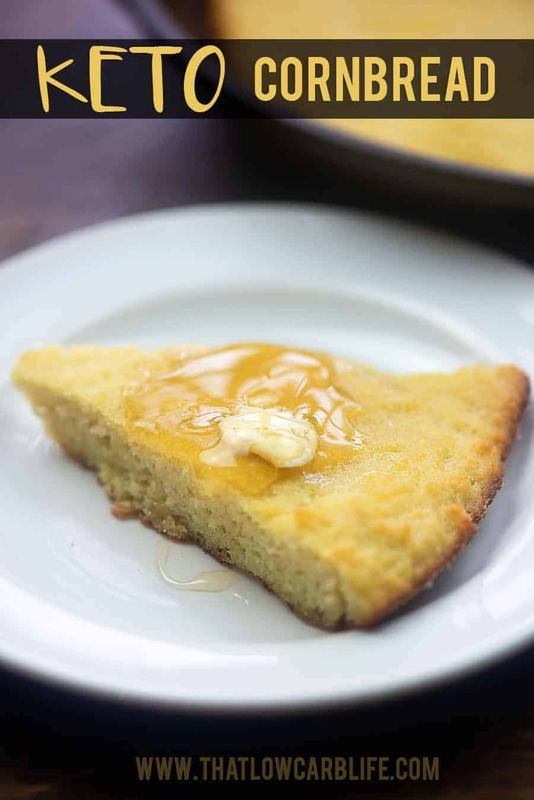 We like our cornbread with extra butter and a little drizzle of sugar free honey substitute. Sooooo good! Coconut Flour: This is easy to find in any well-stocked grocery store, but I can usually find the best price on Amazon. Monkfruit Sweetener: This is my FAVORITE brand of sweetener. No funky aftertaste. It’s made with erythritol and monkfruit extract so it’s perfect for keto. 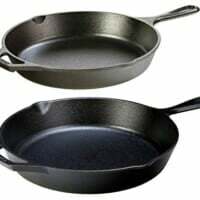 Cast Iron Skillet: We use our cast iron skillet for frying bacon, cooking up chicken, and just about everything else too. It’s my favorite skillet! Pulled Pork Recipe: This one starts in the slow cooker with a simple seasoning blend! BBQ Sauce Recipe: For topping that pulled pork! Cauliflower Soup: Warm, comforting, and totally delicious. Fathead Pizza: I top mine with all the goodness of a BLT. This low carb 'cornbread' contains no corn at all, but you'll fool everyone that tries it! The flavor and texture are spot on! Just 1 net carb per slice! Preheat oven to 350 degrees. Spray a 10 inch cast iron skillet or 8x8 baking dish with non-stick spray. 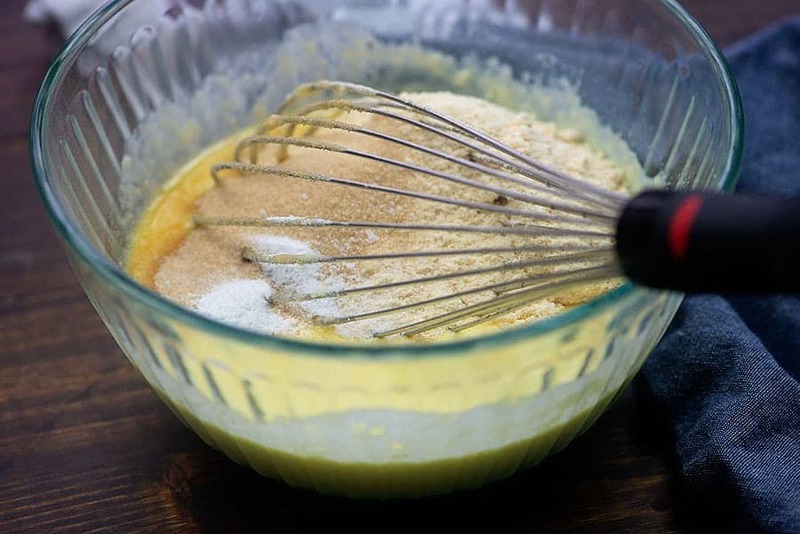 Add the melted butter, cream, and eggs to a mixing bowl and whisk to combine. Add the coconut flour, sugar substitute, salt, and baking soda to the bowl and stir well to combine. Spread the mixture into the prepared dish and bake for 15-20 minutes or until the edges are golden and a tester comes out clean. 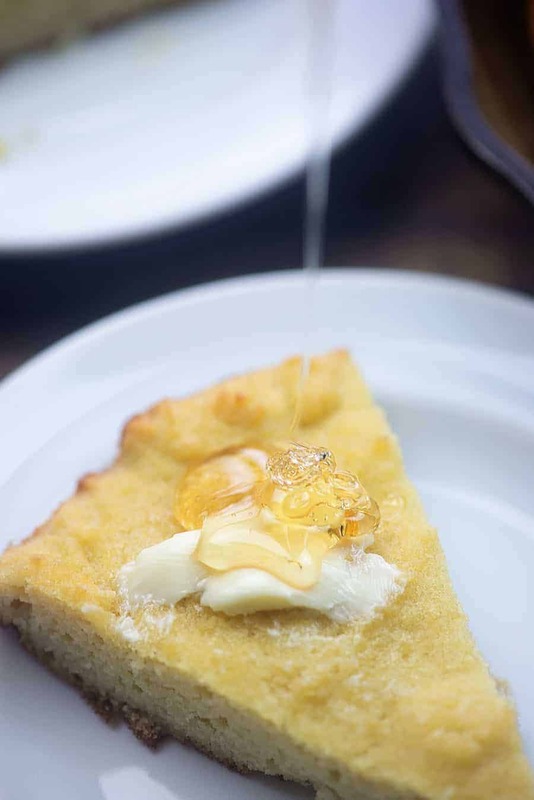 We serve our cornbread with a smear of butter and a drizzle of sugar free honey substitute. 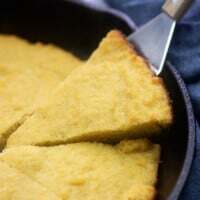 Regarding the sweetener: Yes, this cornbread is a bit sweet. If you prefer cornbread that is not sweet, I'd reduce the amount of sweetener to a teaspoon or two. Corn is naturally sweet and I think the sweetener helps give it a more authentic taste, but you can leave it out if you prefer. I tried coconut cream because that’s all I had. I used the whole – tiny – can (I know. Too much. I did not have another use for it and just dumped it in.) So, I had to bake it 10 extra minutes. My husband says it was excellent! 🙂 Thanks for the recipe. Thank you so very much, for this recipe ! I was missing cornbread to go with LC chili. This’s was a delicious substitute! It’s got a soft moist, slightly sweet crumb. Love that I didn’t have to buy special ingredients. Also , it was very easy… 1 bowl and table-ready in under a half hour! Also , I’m so tired of no bread that I was considering not doing low carb anymore . But , this is definitely gonna help me stick to it. I really need to try more of your recipes ! Let me start by saying, I am a southern black man who cooks cooks lol and I love this recipe. I used one tablespoon of Kroger brand stevia mix (my only variation). I follow strict Keto about 6 months out of the year and miss bread often. I had all the ingredients on hand and whipped up a pan immediately after stumbling across your blog. I was a little afraid of the doughy texture as I smoothed it into my pan (probably just due to the brand of coconut flour) but boy were my fears relieved when I took that first bite. I devoured 2 slices without even buttering the top and called my dad to rave about it. Like I stated before, I am familiar with Keto alternatives and am used to finding so-so “substitutes” just to get by, but this will become a delicious staple. It has made the list of favorites. Thanks for sharing! I made this today. I haven’t had cornbread in two years. It is really really good!! Thanks! !